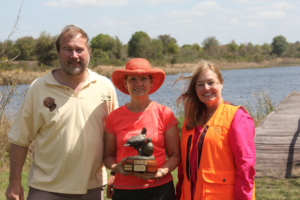 This trophy was donated to the club to honor and encourage the devoted Vizsla handlers. 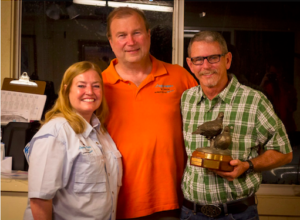 Vizslas handlers receiving this trophy must set about learning, training, practicing and competing in the ever-growing sports of our Versatile Vizslas. In this day and age of instant gratification, it is so easy to send your dog off with a professional trainer. 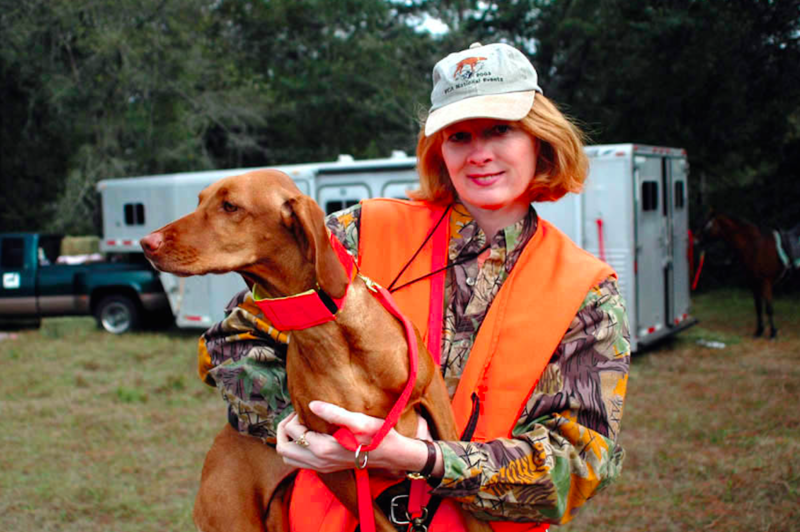 But, this trophy is all about the owner-trainer-handler’s bond with their vizsla. 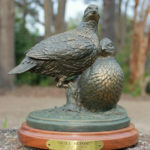 Each year this trophy is awarded to a special, hard-working owner-handler who has shown great improvement in handling skills. 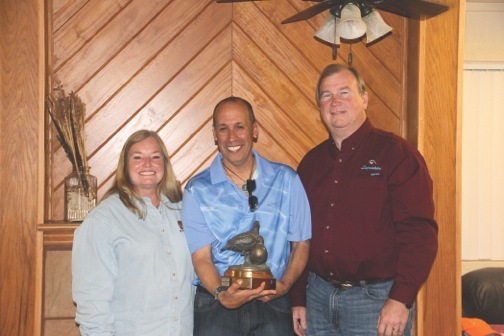 This trophy is given to encourage owner-handlers and to promote the versatile vizsla. 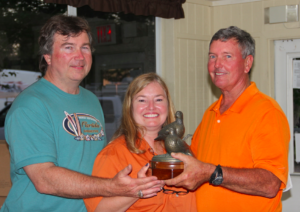 Congratulations to the winners of the Valhalla Handler’s Promise Trophy! This year we have selected a person that has owned three vizslas that we know of. This person got their first vizsla while still in college and traveling a great deal. Just like every vizsla owner, the dog went everywhere this person went. Then around 2005, this person got their second vizsla. This sparked an interest to visit the homeland of the vizsla — Hungary. The trip to Hungary was wonderful and well documented. 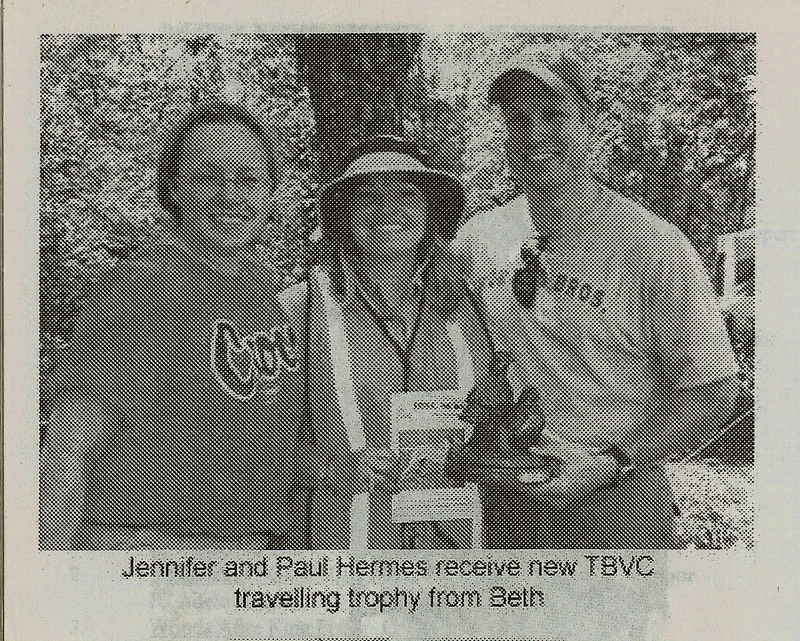 We saw loads of wonderful pictures, as well as a great trip write up in the TBVC Newsletter. Together with the second vizsla, they began a title quest and so far have dabbled in a great variety of sporting venues for our versatile vizslas. 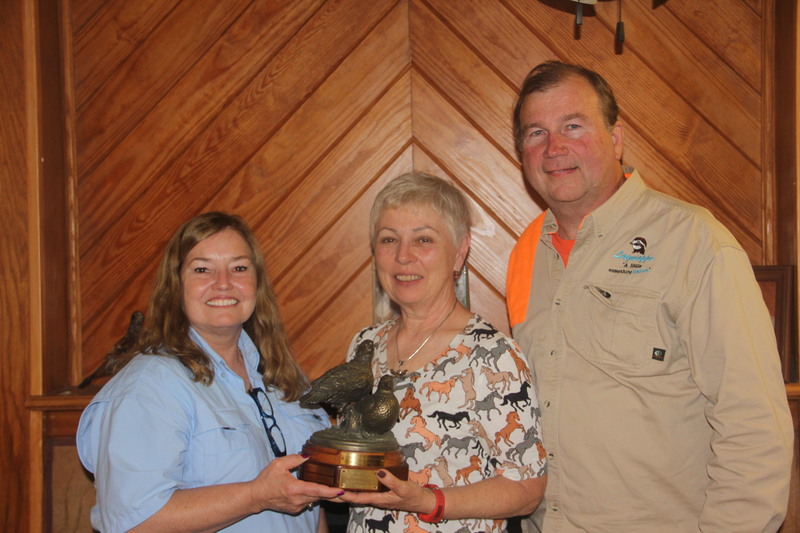 They have earned a Rally Novice title, a Junior Hunter title, a Barn Hunt title, a Canine Good Citizen title, as well as a Canine Good Citizen Urban title. They have also been certified for Nose Work. 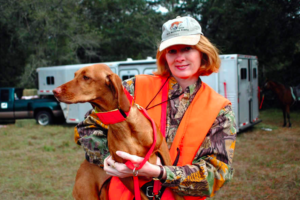 Now with the third vizsla, they have earned a North American Versatile Hunting Dog Association, a.k.a. NAVHDA, Prize I Natural Ability title. They are taking both agility and obedience classes. One of their practice sessions went viral while teaching the weaves poles in agility. It was wonderful seeing the bond between the owner and dog. They have just titled in the new and exciting sport of FAST CAT. It is our great pleasure to present the beautiful Valhalla Memorial Handler’s Promise 2017 Trophy to: Daniel Neger. Congratulations Danny! This year’s Honoree got their first Vizsla as a pet. How many of us started out that very same way only wanting a pet. This year’s Honoree has fostered and rescued another Vizsla. Next, our Honoree got a junior hunter title on her third Vizsla and started with agility classes. Then, this year’s Honoree got truly bitten by the performance bug with their current Vizsla, joining clubs, taking classes, observing events, and asking lots of questions in order to learn as much as possible. This year’s Honoree is always the perfect example of good sportsmanship. This owner/handler is active in hunt tests, field trials, obedience, rally and the new rage of barn hunt. She has earned junior, senior, and several legs of her master hunter as well s Open Barn Hunt titles on two vizslas. This year’s Honoree and her Vizsla went to the National Gun Dog Championship in 2015, and made it around clean. Our Honoree’s vizsla is one point away from her Amateur Field Championship. 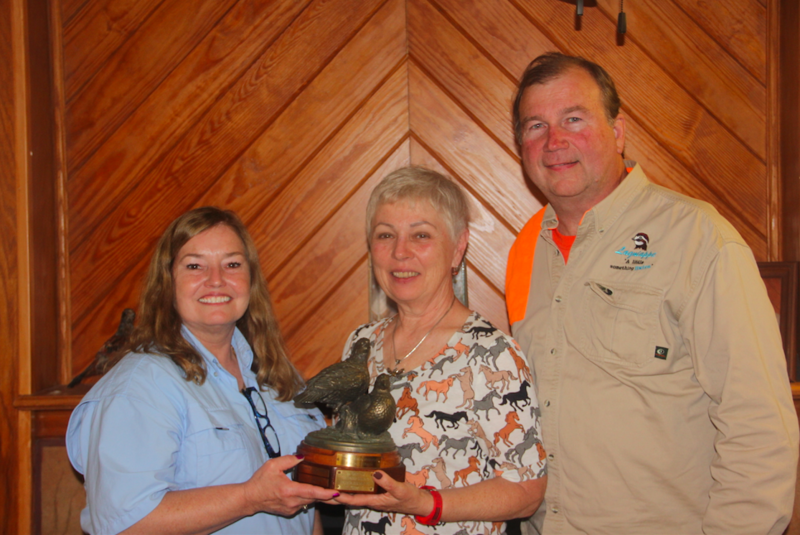 If you haven’t guessed by now, this year’s recipient of The Valhalla Memorial Handler’s Promise Trophy is Pegi Zelneronok! Congratulations Pegi! This year we have selected a self-starter. It has been a great pleasure to watch this person’s progression with his vizslas. This dog fancier dove right into the confirmation ring, training, and handling, and earned a CH with his 2nd vizsla. He earned a Grand Cham-pionship, garnering 7 Best of Breed awards, with his 3rd vizsla. 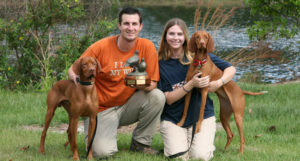 This vizsla lover focused on obedience and rally achieving the Begin-ner Novice, Companion Dog, and Rally Novice titles. His 3rd vizsla earned a CD and was ranked VCA# 5 Novice Obedience Dog for 2014. Now this handler and his vizslas are working, training, and competing in the field. 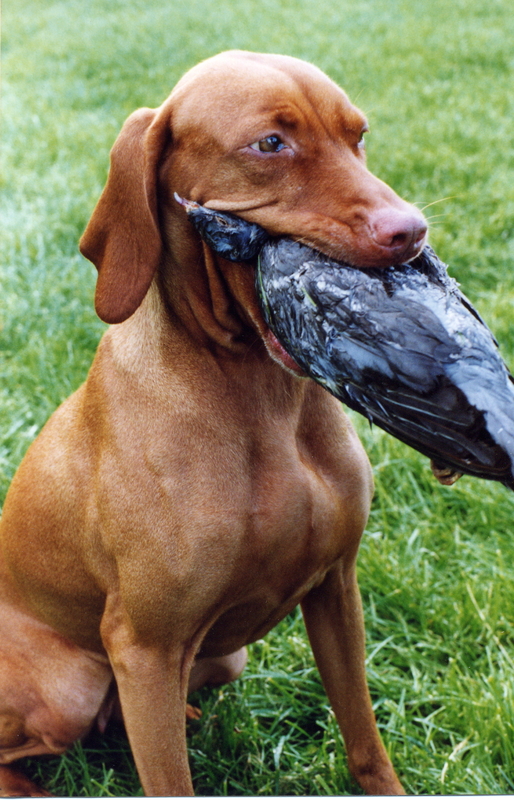 His 2nd vizsla earned the coveted Master Hunter title. His 3rd vizsla earned two Master Hunter legs. This owner, trainer, handler and his vizslas have earned several place-ments in various field trials. His 3rd vizsla is pointed in the field. This team won the Amateur Limited Gun Dog Retrieving Stake at the Panhandle GSP Field Trial, as well as placement ribbons for 3 of the 4 stakes they were entered in. 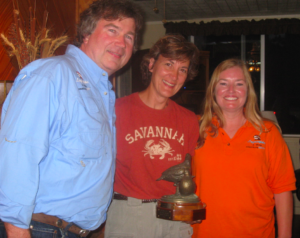 It is our great pleasure to present the beautiful Valhalla Handler’s Promise Trophy to Jim Clayton. Congratulations Jim! This year, we selected a person that started off training and competing in the obedience ring. This person skillfully trained their dogs and put CDs as well as the coveted UD title on them. This person finished their own dog to a Grand Champion title, as well as a Companion Dog title, and has made the leap to the field. After all, it’s been said “Field training is obedience in the field.” This person has asked questions and soaked up the advice of others and has gone back for more. This person has been a joy to watch because this person and their vizsla learn and achieve their goals. She and her dog are currently working toward a Senior Hunter title. Chet and I salute them both and want to encourage them to continue on. Chet and I are proud to present The Valhalla Memorial Handler’s Promise 2014 trophy to Kathy Bass. Congratulations Kathy! This year’s recipient has been in vizslas for quite some time. At first, this owner/handler did confirmation and obedience. Obedience is a humbling venue. This person has garner Rally Excellent titles and Rally Advanced Excellent titles (the highest rally title one can earn). This person has earned Companion Dog titles as well. 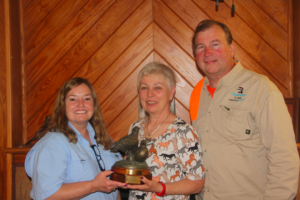 This person expanded their talents to the field some years back and has now earned Junior Hunter titles, Senior Hunter titles, and the coveted Master Hunter titles. 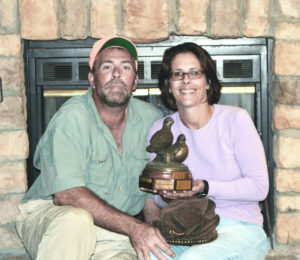 The TBVC Hunting Dog Trophy has been captured two different years by this handler. What stands out most about this handler is their consistency and persistence in training. This handler has worked long and hard and shown great sportsmanship through out the years. This handler is a true southern gentlemen. 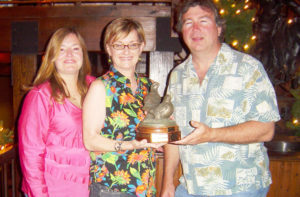 We are so please and proud to award the Valhalla Handler’s Promise 2011 Trophy to Mr. Larry Shramko. Congratulations Larry! professional level achieved great success. She has finished her young vizsla, Soleil, in confirmation ring in lightning speed. She collected junior hunter title, next the senior hunter, and earned her first master hunter leg all before the pup was 4 years old. Candice had already put the International CH,CH, CD, RN, and JH titles on her older vizsla, the late Piper. Candice and Soleil are currently working on the CD and VC titles. Candice has shown great sportsmanship and always has a smile on her face. Chet and I are please and proud to present this award to Mrs. Candice Coates. Congratulations Candi! 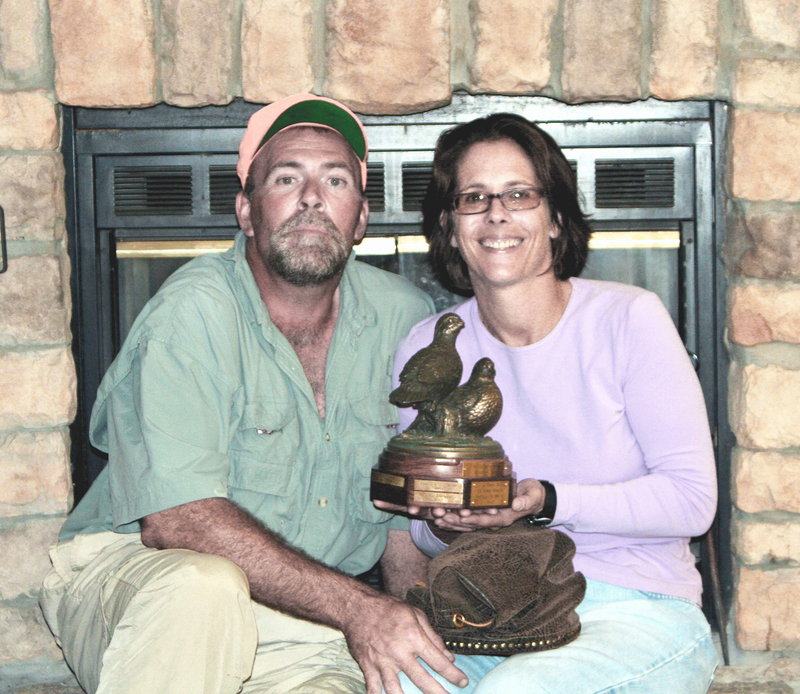 This year we are proud to award the trophy to Mark and Crystal Rothhaar. Crystal started showing one of their vizslas and has been a delight to watch. Both Crystal and Mark have jumpedinto every aspect of field work. Mark has been training and running their dogs in hunt tests, field trials, NAVHDA and going on hunting trips for upland game birds. Crystal has been right there with her camera recording every minute of it. Crystal and Mark are planning to compete in obedience and agility too. This couple has immersed themselves into their vizslas with such enthusiasm, excitement and energy level that has been infectious and inspirational to us all. Congratulations Mark & Crystal! This year we are proud to award the trophy to Vicki McArthur. Vicki, a world-renowned pianist and author, has embraced handling her dogs with the same passion that she applies in her career. Vicki and her dogs, Maggie and Jazzy (and newest addition, Rhett), are working in many venues, including obedience, rally, agility and the field. Vicki and her dogs started with a CGC, then jumped into a JH, then a CD, then came RN and RA. Training was so important to her that she spent the last year attending our field events to run Maggie in Hunting Dog, even though she was not entered in the regular stakes. True dedication! She will soon be competing in Open obedience and Senior Hunter. Vicki has spent a great deal of time learning and communicating with her dogs. All of these accomplishments could not have been achieved without the unwavering support of her husband Charles. Congratulations, Vicki! This year the trophy was awarded at the last TBVC Field Trial at Circle C in Mascotte, Florida in April. This trophy is given to the person who has shown the greatest improvement in handling skills over the past year. Chris and Jennifer O’Brien came onto the Vizsla scene about five years ago. Chris has honed his conformation handling skills to a professional level. This year, they have bred and are training and handling a spectacular litter of puppies. They have done Peewee hunt tests, field trials and best of all, now have the second Vizsla litter in the state of Florida to have earned a Natural Ability Breeder’s Award from NAVHDA! Now they even have their three-year old, Madeleine, in Peewee Junior Showmanship. That is some great handling by the entire family. Congratulations, and we look forward to lots more terrific things in your future! This year the trophy was awarded at the last TBVC Hunt Test at Circle C in Mascotte, Florida in April. The trophy went to Lisa Durham. Lisa is a superb trainer and handler in many areas. She trained and handled her first vizsla Vinny to Utility in obedience and Master titles in agility. But this year she excelled in the new Rally Obedience area and in the field trial area. Lisa and her dog, Edie (Valley Hunter Divine Edition, CD RE SH NA NAJ) won a few first-time awards. Edie was the first vizsla to earn the AKC titles Rally Advanced, and even better, Rally Excellent. Lisa and Edie hit the field trial/hunt test circuit by storm. Together they had some great runs that made many close-minded people take another look at the vizsla. Edie won a four-point retrieving major at the GSP Club of South Georgia’s field trial last November. This was the first time in the history of the club that a win was taken by a vizsla. Together, Lisa and Edie also finished the Senior Hunter title and look forward to Master Hunter competition. So, congratulations to Lisa Durham, handler extraordinaire! 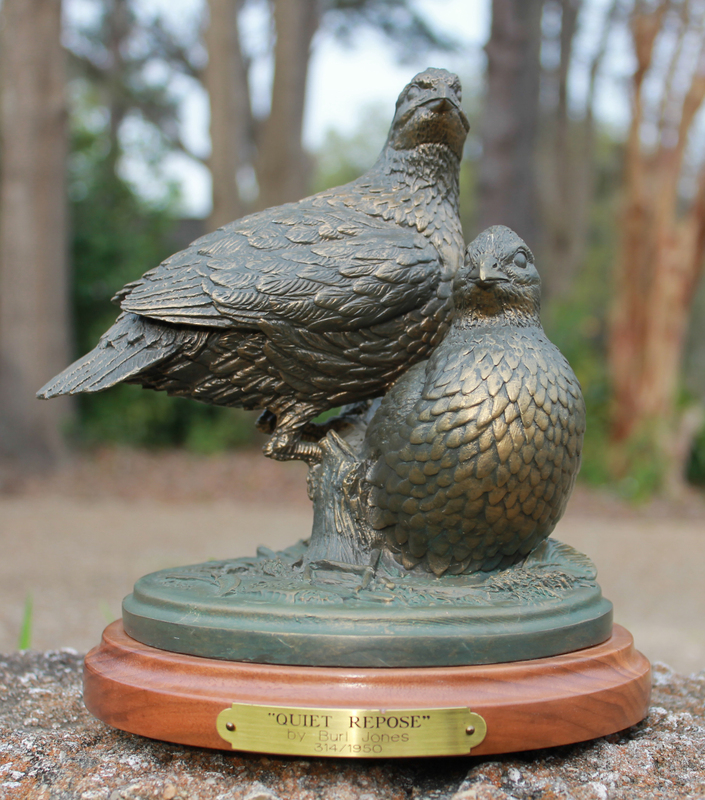 Our inaugural award of the Valhalla Memorial Handler’s Promise Trophy was presented at Big D Plantation at the last event of the 2004 season. The really fun thing about this award is that no one knows who is going to receive it. Chet and I do our best to watch and keep up with all the club members to see which handler or handlers have improved the most or inspired others. Now, the winners of the inaugural award already have two very fine vizsla pets, but it was their new pup that sparked and started the competitive juices flowing. They said this was something they can do together and really enjoy the social life of the Tampa Bay Vizsla Club. This young and exciting couple is diving into several of the competitive venues. Their versatile vizsla is thriving in all they do together. Together, they have put a confirmation championship, a junior hunter title and are working on a companion dog title from obedience on their new dog. Their other two vizslas have joined in on the fun too. We are very happy to award this brand new beautiful trophy to Jennifer and Paul Hermes. Congratulations to you both. We look forward to watching Jennifer, Paul and their dog “Shooter” in the future!